To view a subset of your livestock activities, go to Livestock > Search Livestock Activities. By default, this search page will retrieve the last 12 months worth of livestock activities, but you can alter the date range to any period you like. You can optionally enter text to search for - please note that this is a phrase search. For example, if you search for "black pigs" you will see entries containing the phrase "black pigs", but not "black cows" or "pink pigs". 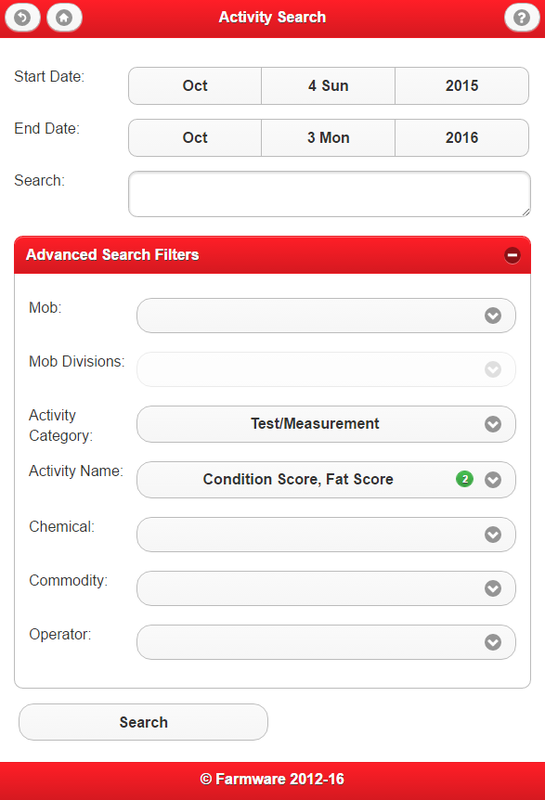 With the recent Farmware release, there is now the option to search with Advanced Search Filters, which includes: mob, mob division, activity category/name, chemical, commodity, operator. You can select multiple items, and can select both current and historic mobs. You can export your search results (to open in Excel) by going to Options > Export to CSV.